Cut the fish into pieces , clean it and keep aside. Soak the tamarind in 1/2 cup water. Heat 1 tsp oil in a pan and roast grated coconut, fennel seeds, shallots and curry leaves until brown in low flame. Grind into a fine paste adding little water. Heat oil in another pan, add fenugreek seeds . When its colour changes, add sliced onions and green chillies and saute. Then add ginger and garlic and saute for few minutes. Add tamarind extract, coriander powder, chilli powder, turmeric powder and salt and boil it. Then add fish pieces and tomatoes and cook in medium flame. Delicious! Fish is my favorite food too. Meen curry is undoubtedly delicious..I always admire varutharacha versions. 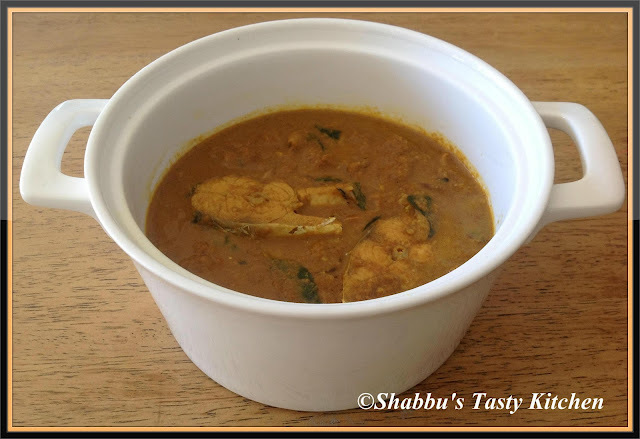 Oh am craving for some good fish curry :) that looks tasty! Mindblowing fish curry,wish to have them for my lunch rite now. Super delicious curry,makes me hungry!! Lovely looking fish curry. Great space u have...... Following u too. wow that curry must be awesome with rice.